Yesterday, 1 November was the wedding day of my deceased parents. If they were alive today, they would have been celebrating their 75th wedding anniversary. But today I came across a couple who have been married for 87 years and still clinging on to each other with eight children and twenty eight grandchildren. 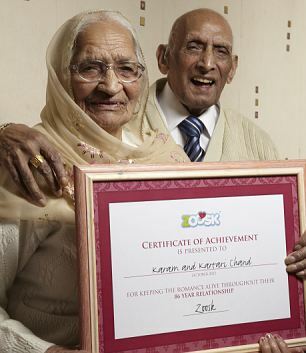 This longest living couple, 107-year-old Karam and his wife Katari Chand, 100, is proof that happy ever after does exist.